Have you gotten an “ORA-00972: identifier is too long” error? Learn what caused it and how to resolve it in this article. This error occurs because the object’s name is longer than 30 characters. The maximum value for a name of an object in Oracle is 30 characters. 00972. 00000 -  "identifier is too long"
*Cause:    An identifier with more than 30 characters was specified. *Action:   Specify at most 30 characters. To resolve the ORA-00972 error, ensure the name of the object you’re working with is less than 30 characters. This could be by creating the object with a shorter name, or altering it to ensure the new name has a shorter name. Can You Change the Maximum Length of Object Names? No, this cannot be changed. 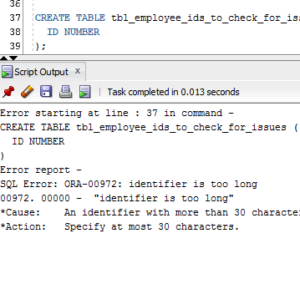 In Oracle 11g, and even 12cR1, the maximum length of an object name is 30 characters. In 12cR2, the maximum value is 128 characters, if the COMPATIBLE value is set to 12.2 or higher. So, that’s how you can resolve the ORA-00972 error.